This is going to be a hell of a day via public transportation. My current plan is to take link 111 to the new SunRail southern most stop (Sand Lake Road), and take that north to the Lynx Central station. After that, it will be a walk to the first of the 3 stores and a bunch more miles after that to hit the others shown above. Have to wait until Monday as one of the three above is closed on Sundays. No problem - I can then spend tomorrow (Sunday) figuring out how to hit as many thrift stores as possible. After that I can either walk all the way back to Lynx Central and take the SunRail home or take a combination of 2-3 busses all the way back. 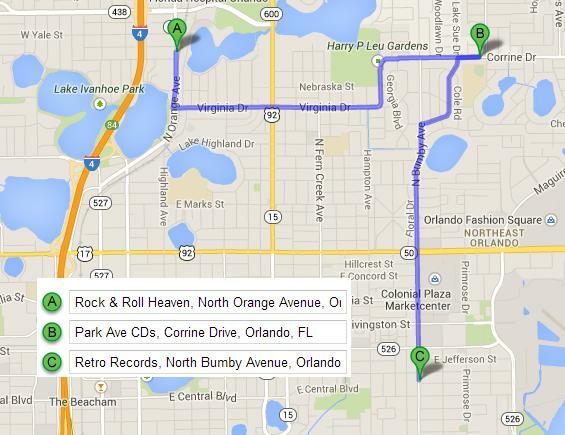 Or possibly even take a cab back to Lynx Central and SunRail home. None of these options are great. But thats just the way it works if you want a bunch of records.